NEW YORK — Roger S. Wieck is glowing like a doting father, though the cause is a tiny painting that sits in a glass vitrine in the center of a gallery at the Morgan Library & Museum. Occupying the left-hand page of a 2.75-by-2-inch prayer book made for Queen Claude of France (1499–1524), the painting portrays the Holy Trinity (at left, top). God the Father and God the Son have identical faces, he points out, signifying that they are one being. "Christ is pre-Incarnate; he doesn't have wounds," Wieck says. "God the Father is asking Christ to swear that he will fulfill the Father's pledge to send Christ as a sacrifice for our sins." The Holy Spirit, in the form of a dove, hovers above. With increasing zeal, Wieck expounds on other aspects of "Trinity Adored by the Choirs of Angels"— how it's surrounded by a cordeliere whose knots reference those on belts worn by the Franciscan orders, for example. His fervor is understandable. 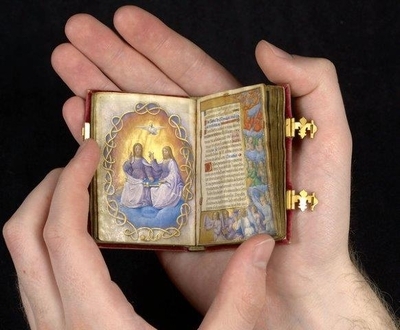 The 500-year-old prayer book is the centerpiece of Wieck's new exhibition, "Miracles in Miniature: The Art of the Master of Claude de France." The show displays 26 works by the largely unknown royal-court artist. Eleven are owned by the Morgan, and all are devotional in nature. At a time when society is increasingly secularized, when adherence to religion, at least in an organized form, is waning, it's Wieck's job, as the Morgan's curator of medieval and Renaissance manuscripts, to wax enthusiastic about religious art. So it comes as a surprise, perhaps, to discover that Wieck himself does not believe in God. Though raised Catholic, he says he "became a nonbeliever gradually when I was in my 20s." Just about the same time, though, Wieck was discovering the manuscripts — illuminated with colorful, often gilded, tableaux and decorative borders — that became his career, no matter that they usually have a devotional thrust. 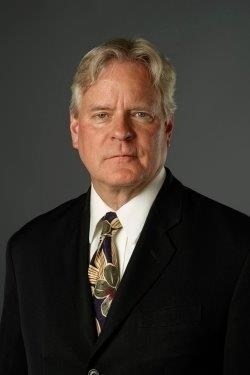 He had graduated from the University of Cincinnati, earned a master's degree in art history there and, in the late 1970s, came east to study at the Institute of Fine Arts of New York University. Then he took an internship at the Morgan. "I was supposed to stay two months," he says. "I stayed two years." Aside from the manuscripts' great beauty, Wieck says, the attraction of these pages was "the combination of pictures and words." He "wasn't put off by the language" — Latin — because he had taken four years of it in high school and two more in college. He adds, "It was an art form you had to sit down and turn the pages of. It was an interactive experience." After curatorial stints at the Walters Art Museum, in Baltimore, and the Houghton Library of Harvard University, Wieck returned to the Morgan in 1989. He now oversees a collection of some 1,300 objects. Among the exhibitions he has organized are "Illuminating Faith: The Eucharist in Medieval Life and Art," in 2013, and "Demons and Devotion: The Hours of Catherine of Cleves," in 2010. He teaches a course on illuminated manuscripts at the University of Virginia's Rare Book School, whose required reading includes "Religion and Devotion in Europe, c.1215-c.1515," "The Stripping of the Altars: Traditional Religion in England c.1400-c.1580" and his own book "Painted Prayers: The Book of Hours in Medieval and Renaissance Art," among others. Indeed, Wieck knows the ins and outs of liturgy and the stories of the Old and New Testaments better than many believers. And, clearly, he doesn't think a lack of belief should lessen interest in devotional art. "I don't understand why people would be put off by religious subject matter," he says. In medieval and Renaissance times, most art was religious. Some of the greatest works by the greatest artists of all times, from Michelangelo to Rembrandt to Titian, evince religious themes. Many people carried around their personal book of hours, which typically contained prayers, psalms, hymns, antiphons and readings prescribed for certain times of the day, as well as calendar pages. "[The calendars] were always at the front of the book, and people kept time by the feast days of the saints," Wieck says. "If you say, 'Meet me on Saint Patrick's Day,' you're on medieval time." Wieck sees attractions specific to religious art. "It's the variations on a theme that's so appealing," he says, naming one: "It's so interesting to see how many variations there are on the Annunciation. Is there a lily? Where does the artist put the lily? How is the Holy Spirit shown: a dove, a stream of light?" Indeed, the vast Metropolitan Museum of Art has more than 20 versions of the Annunciation on view, along with at least 30 of the Nativity and multiple depictions of other signature images such as the Crucifixion and saints, including John the Baptist, Roch and Catherine. The Claude Master's "Annunciation" on view at the Morgan depicts the Holy Spirit as a dove bathed in a ray of light (but there is no lily). It is part of Claude's book of hours, lent by Heribert Tenschert, an antiquarian bookseller in Switzerland. Lavishly rebound in modern times, with a cover laden with 50 diamonds, it contains 15 full-page miniatures, 12 calendar illustrations and nearly 240 decorative borders. 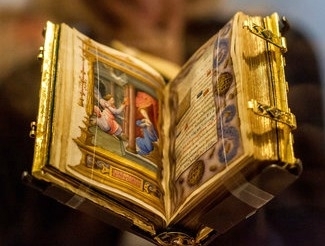 It's shown here publicly with Claude's prayer book for the first time. Wieck (at right) also notes that in an era when art appreciation frequently involves seeking out works by well-known artists, "One of the attractions of medieval art is that it's not signed and is insecurely attributed, so it's not about names. We don't know who the Master of Claude de France is. We know by the eye that something is by him. That aspect I find challenging and very rewarding because all the judgments are about what you see." The Master of Claude didn't even have that moniker until 1975, when the late art historian Charles Sterling studied the two key works in this exhibit and judged them to be by the same hand. The Claude Master is believed to have worked near Tours, in west-central France, in the first two decades of the 16th century. But beyond that, little is known about him. What Wieck sees in the Claude Master is a marvelous painter "who worked in book form." While "Trinity Adored by the Choirs of Angels" is the only full-page illustration in Claude's prayer book, the artist painted 132 borders not composed of the flowers and laurels common in many manuscripts, but rather of miniature paintings of scenes from the lives of Christ, the Virgin Mary and numerous saints. Each, wrote Sterling, "contains an entire Lilliputian world alive with crowds of people, city streets and vast luminous landscapes." Walking around the exhibition, Wieck gets joy from singling out a few and beams (again): "His colors are outstanding. I call his palette sorbetesque — raspberry, plum, lilacs, green. His deepest color is royal blue. His application of paint is so delicate that his brushstrokes are almost invisible. Also the scale: it's of a jeweler or enamelist. There was a fashion for small books; just as cellphones got smaller and sleeker and skinnier, so books got smaller too." In the time of Queen Claude, who was the first wife of King Francois I (1494-1547), the smaller the prayer book, the more important its owner. The fact that Master of Claude worked for the royal courts attests to his prominence in his lifetime. Francois I was a patron of the arts; he bought the "Mona Lisa" and in 1516 lured Leonardo da Vinci from Italy to France, where he spent his last three years. Francois also vastly expanded the royal art collection that eventually formed the basis of the Louvre and started the construction of Chateau de Chambord, one of the most beautiful and largest chateaux in the Loire Valley. Wieck is certainly sold on the Claude Master; he coveted the prayer book for years, and when its owner, Elaine Rosenberg, called him in 2008 to say she would donate it to the Morgan, he got in a cab immediately and went to get it. In recent years, he has also acquired the 12 calendar pages, a single book-of-hours page showing "The Agony in the Garden" and a cutting from a choir book with the image of "Christ Carrying the Cross," purchased just a few weeks before his exhibit opened. "In my 20s I lost my religion," he says, "but I did not lose my appreciation for the art associated with that religion. I didn't say, 'I'll never look at a church again.' "
"Miracles in Miniature" is on view through Sept. 14.